I found myself mesmerized by the ominous jagged peaks of the Olympic Range, the lenitive rush of a nearby glacier river, and the occasional buzz of a local bee bouncing blooming flower to blooming flower along the sunny valley floor. We had arrived. Truth be told, for the past few years, the mysterious awe and biological diversity of Olympic National Park has called to me. From the snow capped peaks of the Olympic Range to the water-saturated calm of the green Hoh Rainforest, and even the melancholic peace along the coast, the vastness of the park fixated my mind for years. There was never a question ‘if’ I would go, but rather ‘when’ I would make my first appearance. 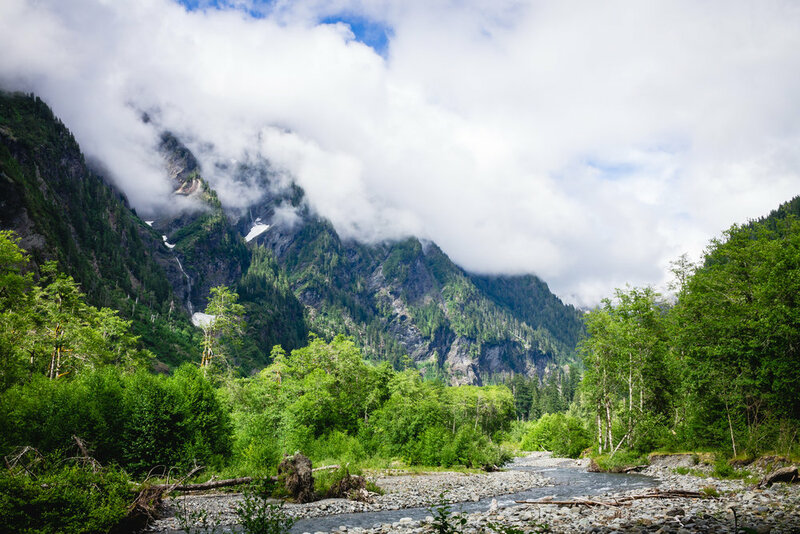 It seemed to all come together when a fellow curious friend reached out with a plan to overnight the fabled East Fork Quinault River Trail. Working along the Quinault River, the trail sits on the Southwestern side of the Olympic peninsula, between the National Park and the National Forest. 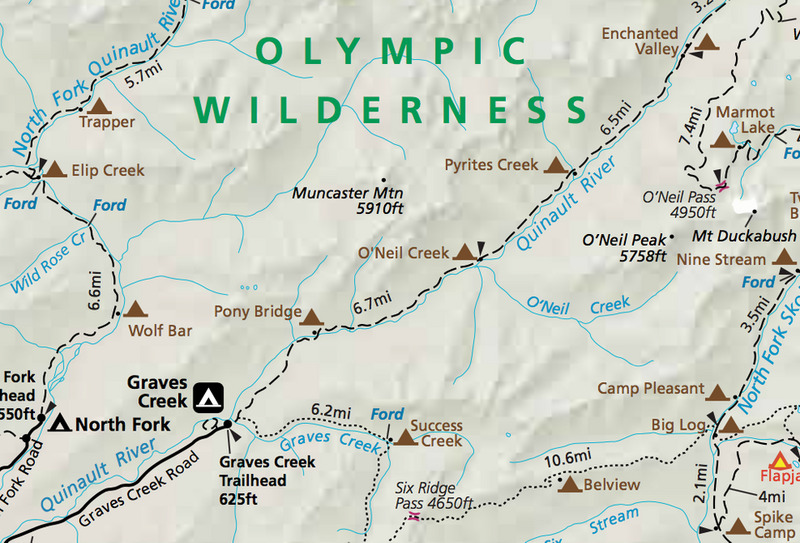 Beginning at the Graves Creek Trailhead, hikers follow the river 14 miles before reaching the historical 1930’s chalet that sits at the heart of the valley. After a late 3am drive into the park, followed by a quick tent pitch and limited hours of sleep, we began our trek at 9:30am under the murky, wet canopy of the old forest growth. With rain jacket hoods flared and a steady wet patter against our shells, we walked amongst the mesmerizing moss covered trunks of Washington’s Western Hemlocks. After a brief elevation gain, we sat hundreds of feet above the river, its rush now merely an echo in our ears from before. As we rounded a large fallen tree, there a mere 75 feet ahead on the trail slowly paced a black bear. My heart rushed with excitement! I examined its face as it lumbered across the trail and began working its way up the side of the hill to our right, slowly vanishing behind a blanket of greenery. For the next few miles, I could only think of how lucky we were to start our hike with such a sighting. Ever so slightly, the skies began to clear up just as we emerged some 4 miles in along the river bank, having worked our way back down in elevation over the previous mile. Suddenly, the infinite, but characterizing gloom of the rainforest gave way to a brief moment of sun, revealing the once invisible mountains that had surrounded us on either side the entire trek thus far. In the same instant, the forest around us appeared reenergized, now glowing multiple green tones in the momentary squirt of the sun’s rays. After passing the halfway marker at O’Neill Creek, we decided it was the perfect time to stop for lunch. Unscrewing the lid of our bear canister and sitting down with my peanut butter sandwich, from nowhere a wave of mosquitoes came out of the wet forest woodwork. After one too many bites, we were forced to put off our energy-sapped stomachs and continue on to a better, more pleasant stopping point. Two bridge crossings and a mile later, we pulled over to rest and eat at a seemingly perfect place slightly off the trail that led down to the bank of the Quinault River. An uninterrupted view of the mountains proudly sitting in front of us, we dined on bananas and peanut butter, tortilla, granola wraps with some accidental trail spice serving as extra protein before packing up and moving on. 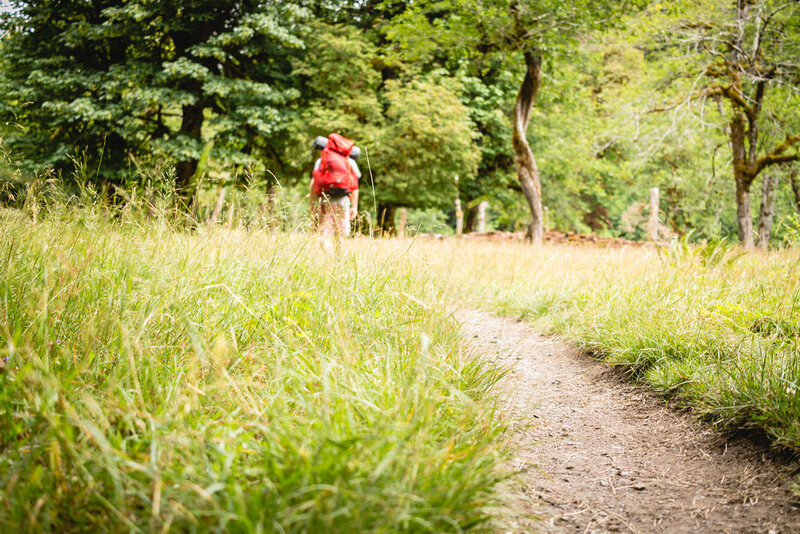 Over the course of the next three miles, we began to feel the weight of our packs digging into our shoulders and excessively stretching our hips. These feelings multiplied as we worked our way back up a mild elevation gain just poignant enough to remind you it was there. However, the fantasy that surrounded us provided the greatest distraction imaginable. Sun shining in full force now, moss gilded the many trees as the leaves filtered a warm glow that resonated along the forest floor. It was extremely quiet, with only the occasional break at the hands of the refreshing cool breeze that pushed us closer to the Valley ahead. 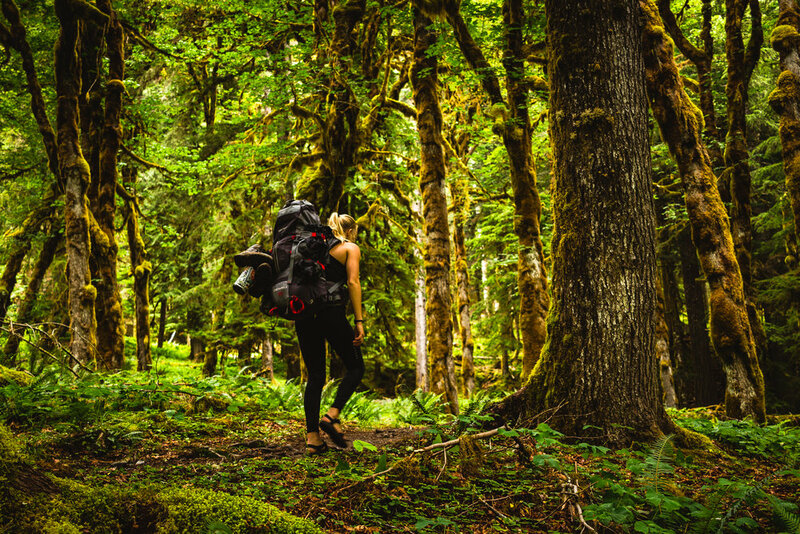 Shoulders rigid, hips slightly fatigued, we broke through a clearing and arrived at a makeshift wooden gate, the entrance to The Enchanted Valley. A newfound hiker’s high rushed our minds, as we picked up our pace, excited for what lay ahead. The snow capped Olympic Range flooded our perspective while we crossed a final river before dropping our packs and high fiving. We arrived. Wasting little time in throwing our boots off, we pitched our tent and setup camp. As my friend took a pleasant hammock nap under the comfort of two trees, I lay on my pad, looking up at the mountains in front of me. For hundreds of feet, providing the front layer to the green mountain shelves, cascaded dozens of waterfalls. Each unique in size, they seemed to plummet hundreds of feet down to the valley floor, sending a wavelength of audible rush that echoed off of the surrounding Olympic walls. Nearby, birds sang in chorus, the occasional solo taken by only the boldest. Above my head, the leaves shimmered and danced in the faint, yet constant glacial breeze. Farther up the spine of the mountain ridge, the clouds sat stubbornly, their dense form seeming to weigh down the sedimentary towers, squishing them closer towards the valley floor. From my angle, I could see sprinklings of snow that slowly turned into large packs. Higher still, these packs gave way to the toes of the Anderson Glacier. Far off in the distance, a sight emerged only seen from the bank of the river in the center of the valley. Mount Deception and Chimney Peak commanded the attention of the birds, the bees, and the bears in this wonderland. Smooth crags does not even do them justice, as their shrewdness gave it a deviously seductive portrait, playing neither friend nor foe to those who dared to summit. My legs and feet sore, my back tight from the 14 miles of pressure emanating from the straps of my pack, bears sighted, and grouses slyly seen, it immediately became clear that enchantment was in the air. The Enchanted Valley, a fitting name for nature’s splendor. But perhaps the Enchanted Valley limits the wonder of the journey it took to arrive, which was not short of enchantment itself. Ferns, moss, and endless trees demanded attention. Nature’s garden was all around from mile 1 to mile 14, and the 14 it took to get back the next morning. The journey, though admittedly fatiguing, enchanted in its own right. P.S. Thank you to Nicole Knutson for planning this trek!